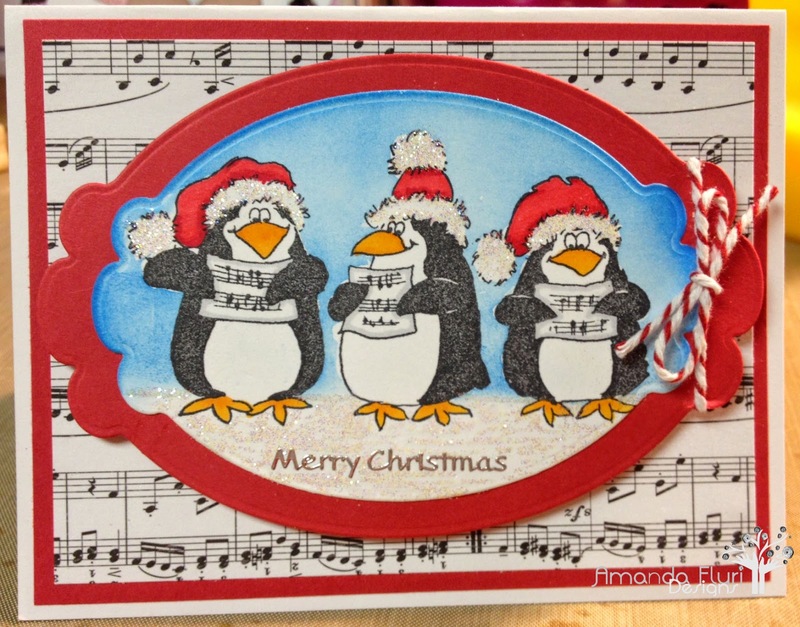 I am so excited to be entering a card in again for another really fun Merry Monday Challenge. When I first saw the theme for this weeks challenge, I regretted using the image that I had for Merry Monday #141, but I came across a stamp in my collection that worked equally as well. If you are coming to my blog either from the challenge page or elsewhere please show me some love in the comment section. I would love to hear what you think of the card. Here is the photo for the theme for the challenge. I am going to do just this! I decided to attempt to encompass both parts of the challenge, create a card with a music theme and Christmas carollers. In the past I have been known to go a little crazy with my cards, however for this week I really wanted to keep the card simple, clean and wanted the image to be the focal point because its so stinken cute. I will do my best to link to all the supplies that I used for this card, however not all products may be still available as they are from my stash, and some the source is unknown. Clear Glitter - on the penguin's hats and the snow on the ground. Peel Off Stickers - for the words "Merry Christmas"
Very cute card Amanda, this is such a fun image. Thank you for joining us for Merry Monday. Thanks for letting me play along with the challenge. I a really enjoying myself :) I've had this stamp for years, and had only used it once before now. I don't know what I was thinking. Thank you for having me and Thank You for your kind words! 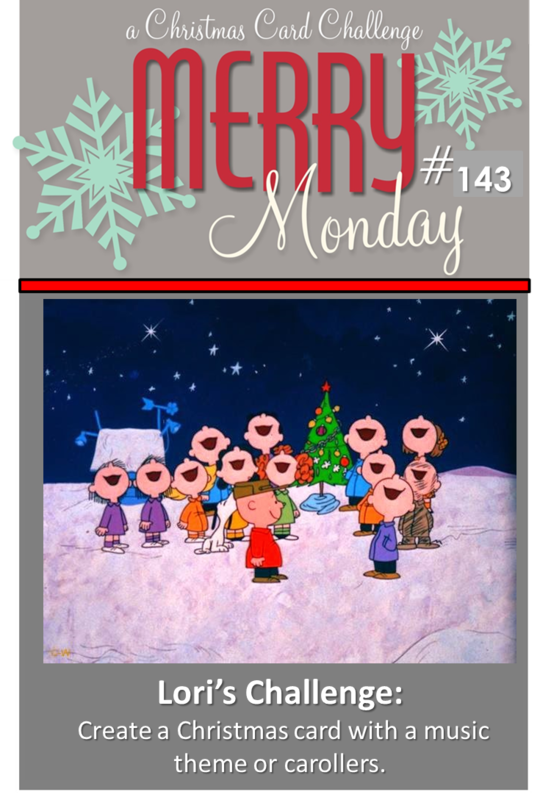 I am very much enjoying creating cards for the Merry Monday challenges! I was so happy to play along for #144 too. Love your card! The penguins are so cute! Thanks Sue. I used a penguin on my card for this weeks challenge too. It's only a coincidence that it worked out that way. Amanda, I LOVE these penguins! 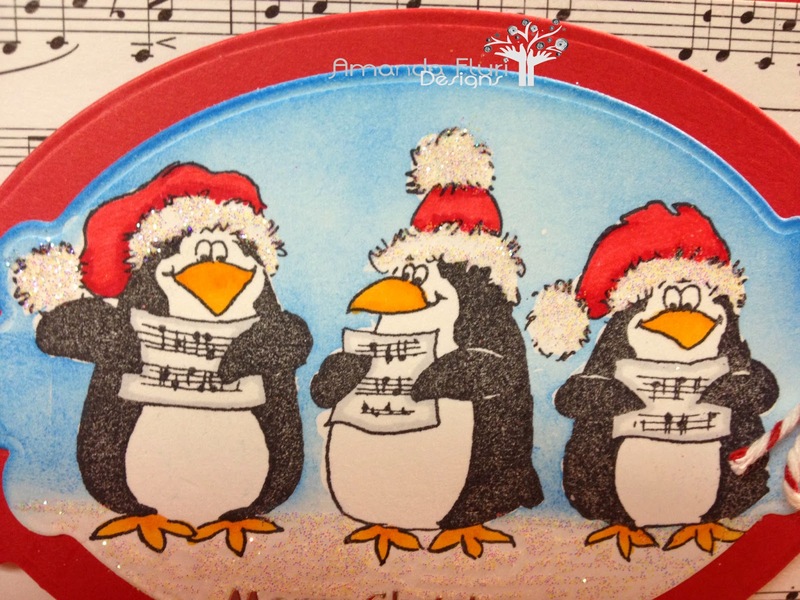 I have a similar stamp with the three penguins riding on a sled...I love this trio! I absolutely love that you glittered their furry hats and snowy ground...and the music background paper is perfect! Just an adorable card! Thank you so much Judy. 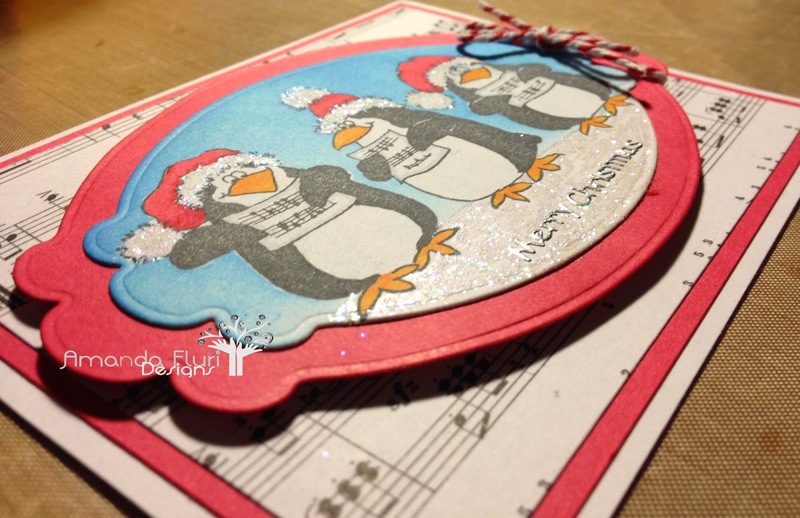 I am thrilled with how this card turned out and love glitter so had to put it everywhere I could :) I love penguins they are so cute no matter what they are doing! Thanks again! Thanks Chris. Penny Black does a fabulous job with her images for her stamps.